2019: PDP Coalition Presidential Candidate Under Threat? The plans by 39 political parties which formed an alliance with the Peoples Democratic Party to remove President Muhammadu Buhari from office through the polls next year, may be heading for a fall. What is shaking the table in the opposition house? According to The Punch investigations, indications that the alliance has come under a big threat manifested when the Independent National Electoral Commission released the timetable for party primary election. The timetable indicated that all the parties that would be taking part in the 2019 general elections are expected to organise their primaries between August 18 and October 8. Findings by The Punch revealed that all the political parties involved in the alliance have put in place mechanisms to conduct primaries that would produce their presidential candidates for the February 14, 2019 election. Authoritative sources close to some major political parties involved in the alliance told one of our correspondents that each of the parties had concluded arrangements to sell nomination and expression of interest forms to their willing members for the exercise. Notable political parties involved in the coalition include the Peoples Democratic Party, Social Democratic Party, Action Democratic Party and others. Leaders of the parties had, during the signing of their Memorandum of Understanding on the grand alliance ahead of the general elections, vowed to present a single presidential candidate for the election. Apart from having a sole presidential candidate, the Chairman of the SDP, Chief Olu Falae, had also stated that the coalition must work together to have single candidates for elections in some states, especially for the governorship, national and state assembly elections. Falae had noted that such arrangement was one of the ways that the ruling APC could be defeated. He had also argued that it would be difficult for an APC president to rule, if the party forms the government at the centre, without having majority lawmakers at both chambers of the National Assembly. Sources from two of the parties that formed the alliance, told one of our correspondents in separate interviews, in Abuja on Saturday, that it would be difficult to persuade presidential candidates to step down after they must have emerged as their parties’ standard bearers. One of the sources said such candidates would have spent money for campaigns and on delegates, adding that the leadership of the coalition also needed to know that the conventions that would produce the candidates would be monitored by INEC. He said that the Electoral Act had also made it difficult for the political parties to withdraw the names of their candidates from the commission without the consent of the affected candidates. “Such candidates have to even write the commission and explain why he is withdrawing from the race, “ another source added. One of them said, “While we plot on how to defeat President Muhammadu Buhari, who we know will be the candidate of the APC in 2019, we must also know that there are dangers ahead of us. “Now, all the affected political parties involved in this coalition are to produce their presidential candidates before we will now go into talks on who will step down for the other. “We shouldn’t forget that we are dealing with an unfriendly INEC, which is going to monitor the conduct of the presidential primaries. The commission may insist that the names of the winners be submitted, unless the affected candidates agree not to go into the election. “Now, what happens if the affected candidates do not agree to step down? Who do we hold responsible? Or, if the candidates now decide to step down on conditions, such as defraying the cost of their campaigns and asking for slots in the incoming government if we win. Who will make the refund to them? It was however gathered that the coalition under the aegis of Coalition of United Political Parties is aware of the implications of each political party submitting the name of its presidential candidate to INEC. Already, it was gathered that its leaders had started the process of making sure that the name of the standard bearer and the party, would be unveiled before the last day for the submission of the presidential candidates. Another national executive member of one of the parties involved in the alliance, Social Democratic Party, told one of our correspondents that CUPP might be unable to achieve its aim of supporting a presidential candidate of the alliance. He said, “In spite of the MoU that we signed, I know that some of us are too ambitious and if they lost the ticket at the alliance level, since their name will still be with INEC, persuading them to write the commission to dump their aspiration may be difficult. “It happened in the Osun State PDP governorship primary, when the national leadership in its bid to resolve the crisis generated by the election, directed Ademola Adeleke to withdraw his running mate, Albert Adeogun, from INEC so that Dr Akin Ogunbiyi’s camp can nominate a replacement. Though Adeleke agreed, he refused to do that. He simply asked the man to go under until the expiration of the number of days allowed by the Electoral Act to do so. So, the same thing may happen to the alliance after each of the parties, including our party, the SDP, must have conucted our primaries. “I have my fears for the alliance but I don’t want to rock the boat. That is why I plead with you not to mention my name in your story. I also know that most leaders of the 39 parties are not in tandem with the arrangement by the coalition but when you talk to them in the open, they will say no." Ogunbiyi had confirmed this while addressing his supporters at Ileogbo, in Ayedire Local Government Area of Osun State after the leadership of the PDP held a meeting with him and Adeleke in order to resolve the differences between them recently. Ogunbiyi said Adeleke’s camp did not honour the agreement as the name of his running mate was not withdrawn from INEC. However, there are fears that some of the presidential candidates of parties involved in the coalition might take advantage of the provisions of the Electoral Act on how candidates who won primaries and whose names had been submitted to the commission could be changed. INEC, in its frequently asked questions, explained the process through which names of such candidates could be dropped. On whether a candidate can be changed or substituted by the party, the commission answered yes, but with a caveat. But the Head of the Media and Publicity Committee of the CUPP, Mr. Ikenga Ugochiyere, told The Punch that all the parties were free to conduct their primaries. He said once that was done, CUPP would now step in to decide the next line of action. He said that the coalition was aware that only candidates whose names had been submitted to the commission could withdraw from the race, CUPP was already working on “a final road map” on how to avoid running into a legal crisis on it. Asked why it was difficult for the coalition to test its strength with the Osun State governorship election slated for September 22, Ugochiyere said the members only agreed to work together for the presidential election. “The MoU is very clear on the area of collaboration which is the presidential race but parties that wish to work together at the state level can go ahead and do so on their own terms,” he added. Also, the PDP has expressed hope that the coalition will unseat President Muhammadu Buhari. The National Chairman of the party, Prince Uche Secondus, said this in an interview with one of our correspondents in Abuja on Saturday. He said the plan of the APC was for the coalition to fail, but added that all the parties involved in it remained committed to its success. “We have passed the stage of doubting. We are on a critical stage of implementation and with the commitment we have seen so far, we will sack President Muhammadu Buhari next year,” he added. Secondus also allayed the fears of members of the party and others, over the high number of its presidential aspirants. He told The Punch that the party would manage the primary in such a way that its outcome would be acceptable to every aspirant. Secondus said he told all the aspirants that neither him nor members of the National Working Committee of the party had any favourite aspirants. The PDP boss said, “We have no preferred candidate. All of them are eminently qualified to run. What we will do is to provide the enabling environment that would make the delegates pick or elect candidates of their choice. There are about 10 aspirants currently jostling to pick the sole presidential ticket of the PDP at the moment. 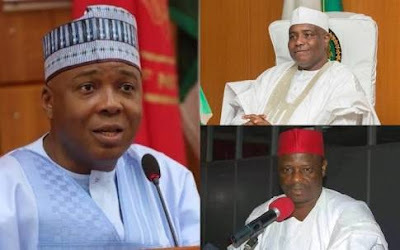 Among the aspirants are a former Vice-President, Atiku Abubakar; Governor of Sokoto State, Aminu Tambuwal; Governor of Gombe State, Ibrahim Dankwambo; and a former Governor of Kano State, Senator Rabiu Kwankwaso. Others are, Senate President Bukola Saraki; a former Governor of Kaduna State, Senator Ahmed Makarfi and a former Minister of Special Duties and Inter Governmental Relations, Alhaji Kabiru Tanimu (SAN ). However, the National Chairman of the Democratic Peoples Party, Chief Benson Gershon, explained that all the parties in the alliance would organise primary elections to pick their presidential candidates. He said the candidates would then participate in the ‘electoral college’ that would produce a consensus candidate of CUPP, who is expected to contest against Buhari.